In this section of the website, we try to give you a taste of the fascinating story behind the Silver City company. It wasn't just about flying cars across the Channel - as you will see. The Silver City story begins with the formation of a company called British Aviation Services (BAS) at the end of 1945. This was set up by the shareholders of the British Aviation Insurance Company to provide technical services to the aviation industry. The managing director was Air Commodore Griffith Powell - usually known as 'Taffy' - and with him were several ex-RAF people who had served with him in Ferry Command and Transport Command. One of their early tasks was to act as technical advisers to Alberto Dodero - an Argentine shipping magnate who was planning to operate an air service between Buenos Aires and Montevideo. He purchased five Short Sandringham flying boats which were flown out to Buenos Aires by BAS and on which a number of Dodero's friends travelled as passengers. One of these was John Govett, Chairman of the Zinc Corporation - a major mining company with its headquarters in London and its principal mines in Australia. After this introduction to BAS, the Zinc Corporation decided to set up a company to provide them with air transport and general charter services. BAS were to manage the company and they also had a small shareholding. The three directors were John Govett, Air Commodore Powell and W S Robinson. 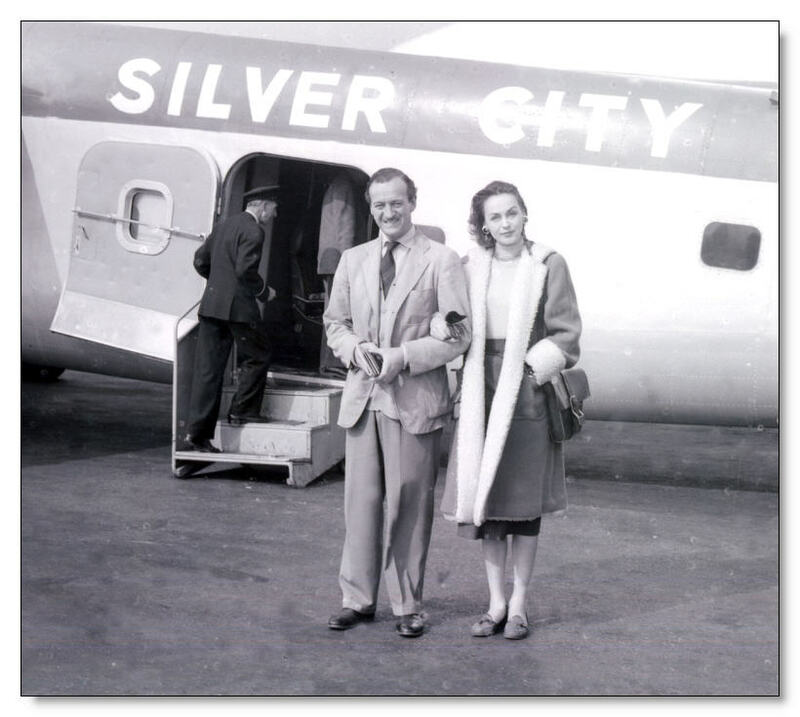 The name chosen for the new company was 'Silver City Airways' - for the reason that the Zinc Corporation's principal mines were at the town of Broken Hill in New South Wales, a town popularly known as 'Silver City' from the days when it was principally a silver mine. 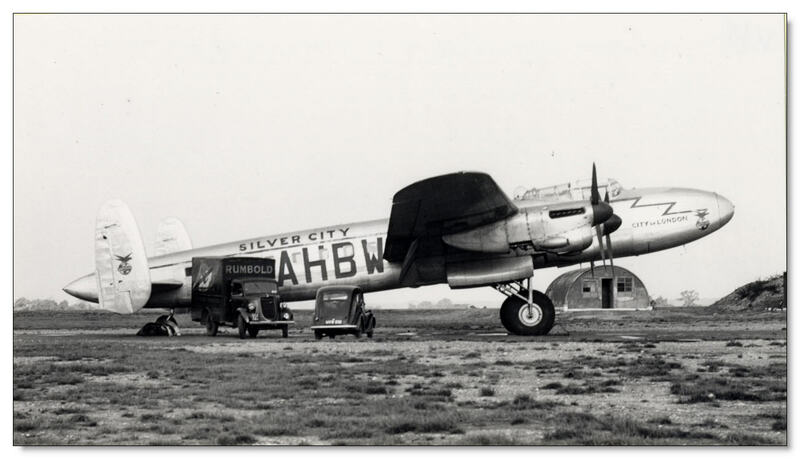 Silver City Airways was registered in late 1946 with a fleet of Avro Lancastrians and Douglas Dakotas and its first charter flight from London Airport (Heathrow) to Sydney left on 24 October 1946, operated by a Lancastrian under the command of Captain John Adams. The round trip via Johannesburg with refuelling stops en route took 14 days. A large engineering base was established at Blackbushe Airport (near Camberley, Surrey) in 1946 and maintenance of the Silver City Lancastrian and Dakota fleets was undertaken there from early 1947 - together with maintenance work for other operators. In the same year, the partition of India before Independence had resulted in a mass migration of Hindus from the newly-formed Pakistan to India and of Muslims in the other direction. An airlift was organised in September 1947 and Taffy Powell despatched Silver City's Dakotas to India. These aircraft could carry between 30 and 40 passengers and Powell would have loved to have "stretched" them to increase their capacity. However, he soon heard that one of the new Bristol 170 Freighter demonstrators was standing idle at Filton and had a better idea. 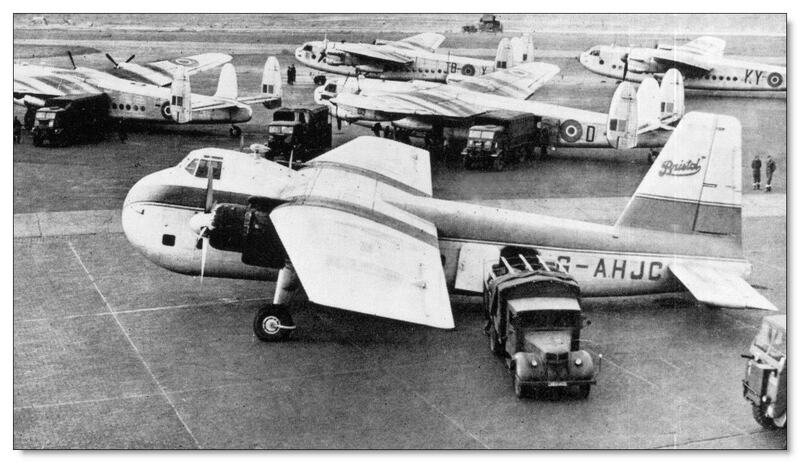 This aircraft (a 40-seat, all-passenger Mk II 'Wayfarer' registered G-AHJC) was duly leased from the Bristol Aeroplane Company and sent to India. It soon created a record by lifting 1,105 people and their baggage in nine days. On one flight, it carried 119 people after all the seats and fittings had been removed. One of Taffy Powell's favourite pastimes was to take his Armstrong Siddeley Lancaster car touring in France. Making the Channel crossing by sea was a time-consuming business in those days and Taffy soon realised that the standard Freighter version of the Bristol 170 with its 'clamshell' nose doors and substantial cargo hold could provide the answer, so a second Bristol demonstrator (G-AGVC) was soon being ferried back from its North American tour. The first Silver City car ferry operation took place on 15 June 1948 as a proving flight from Lympne (near Hythe) in Kent to Le Touquet on the French coast, using the same aircraft - G-AGVC - and with just one vehicle (Powell's Armstrong Siddeley) and a set of loading ramps on board. The airfields had been chosen as being the two closest cross-Channel civil airports - just 47 miles apart. The inaugural public flight followed on 14 July 1948 - Bastille Day in France. 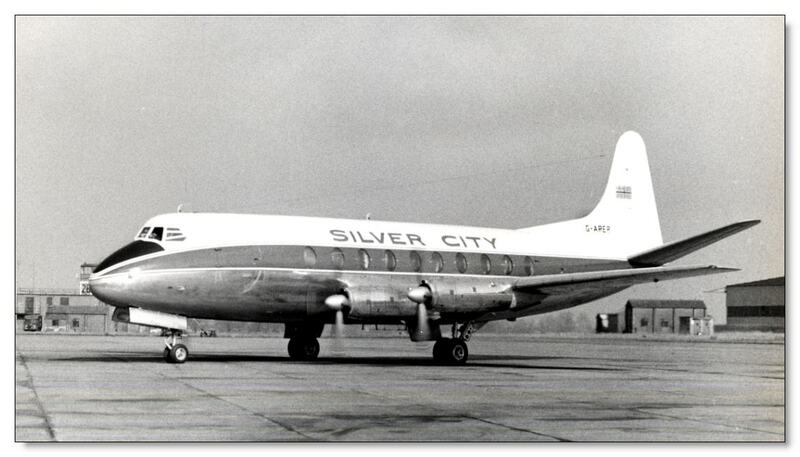 The Silver City Air Ferry was born. 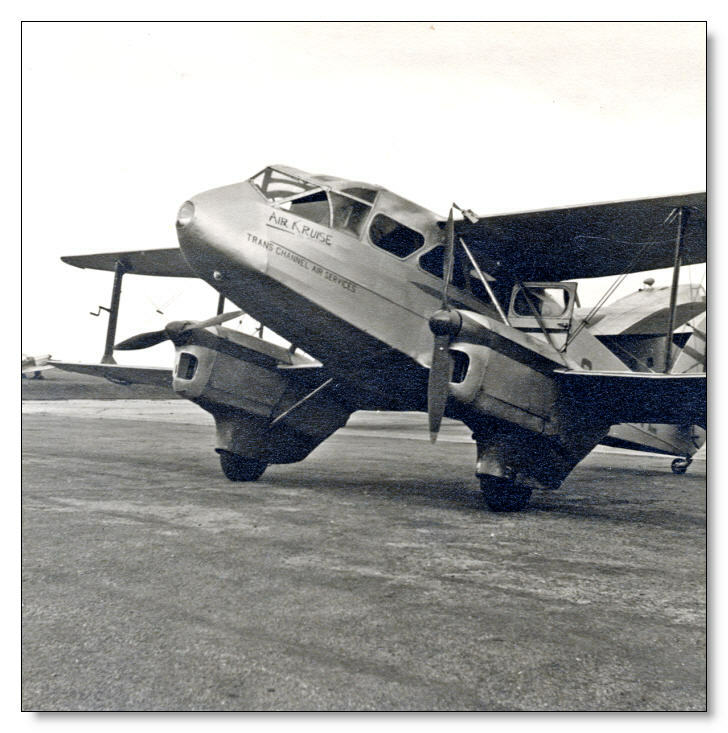 Initially, the Air Ferry flights had to be operated on a charter basis, with most flights being taken by the AA and RAC but on 2 May 1949, the Ministry of Civil Aviation issued a licence for one year's scheduled service. 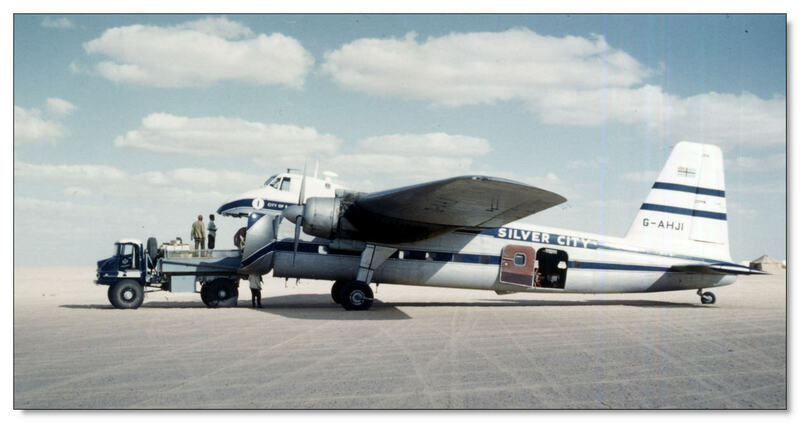 Meanwhile, Silver City had been taking part in the Berlin Airlift, having joined with a single Bristol Freighter in September 1948. This was such a success that further Freighters were leased from Bristols. 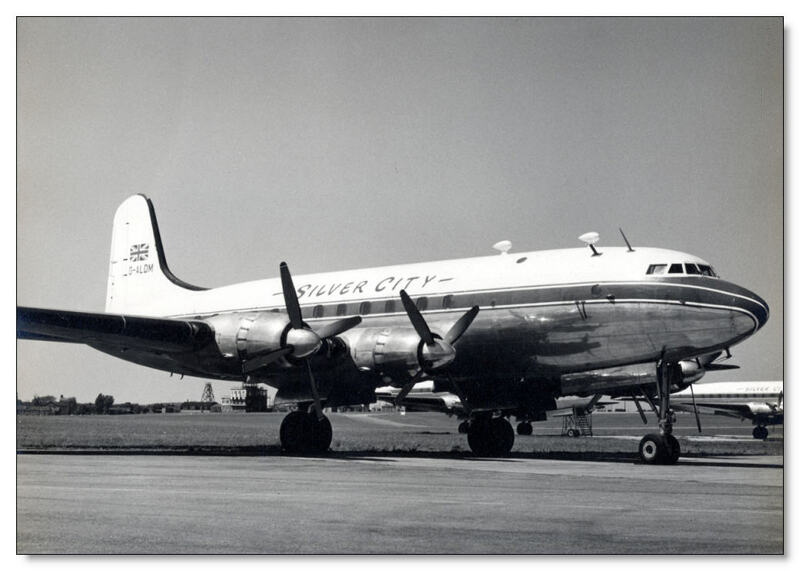 When the airlift was scaled down in February 1949, Silver City's Freighters were the last civil twin-engined aircraft there - having flown a total of about 800 hours. 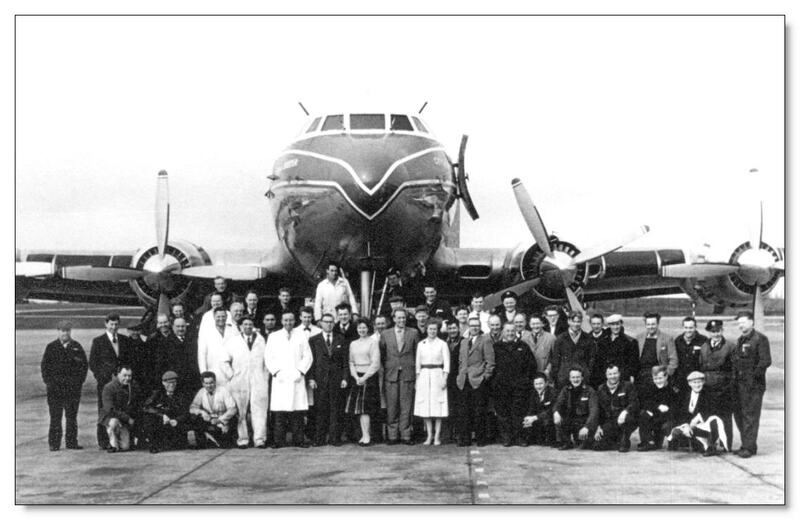 The airlift continued for some years and Silver City's involvement - including the use of Dakotas and a Breguet Br761S 'Deux Ponts' - continued until 1953. Bristol 170 Mk IIA G-AHJC on the Berlin Airlift, September to November 1948. The aircraft was on lease to Silver City from the Bristol Aeroplane Company. In late 1949, the Zinc Corporation decided that it no longer needed its own air transport company and could rely on scheduled airline services. Its total shareholding in Silver City was therefore acquired by BAS, who adopted the trading name of 'Britavia'. 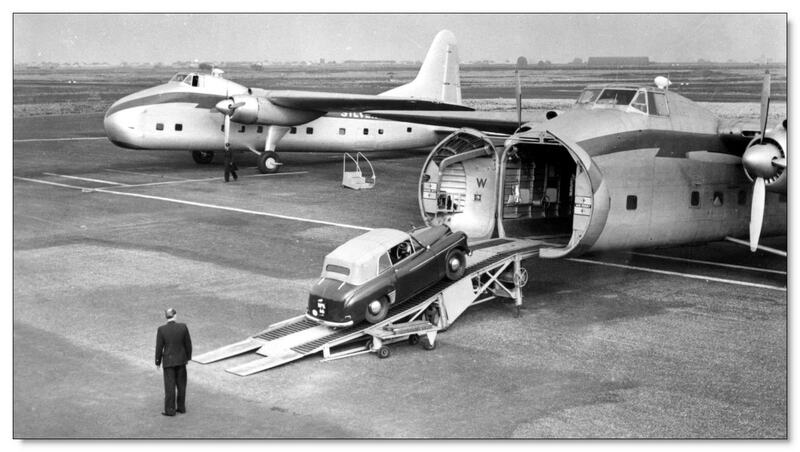 By 1952, the Air Ferry operation had proved a great success - but there was often an imbalance between outward and return loads. Taffy Powell realised that a larger aircraft with a bigger payload but lower operating costs would help to overcome the problem. The result was the Bristol 170 Mk 32 - or 'Superfreighter'. This could carry three cars compared with the standard Freighter's two. Silver City ordered six of the new aircraft at a cost of £90,000 each for delivery in the spring of 1953. Towards the end of 1953, it was clear that the all-grass airfield at Lympne was unsuitable for future expansion - particularly with the arrival of the larger Superfreighters. A new home was needed but none of the existing airfields was deemed suitable, so the obvious answer was to build a new one. For this venture, additional capital would be needed and Silver City Chairman Eoin Mekie persuaded the shipping company P&O to make a substantial investment. After reviewing a number of possible locations, a site near the town of Lydd at the northern end of Dungeness point on the Kent coast was selected. A contract for £400,000 (about £8.4 million today) was awarded to Richard Costain with completion planned for the summer of 1954. Silver City's purpose-built new home was to be called 'Ferryfield'. With the injection of cash by P&O came another change of ownership and in February 1954, General Steam Navigation (a P&O subsidiary) took control of BAS, Britavia and Silver City. Delays in the construction of the new runways at Ferryfield meant that it did not become operational until well into the summer season. On 13 July 1954, the inaugural flight took off for Le Touquet with a total of 70 flights being made that day. On 3 October 1954, the Silver City house flag was hauled down at Lympne for the last time as the final flight left with Chairman Eoin Mekie on board. Lympne had seen nearly 55,000 vehicles and 208,500 passengers carried since 1948 - all without incident. Meanwhile, at Ferryfield, there were 222 Channel crossings during one day in July and crews were now often flying six round trips a day. 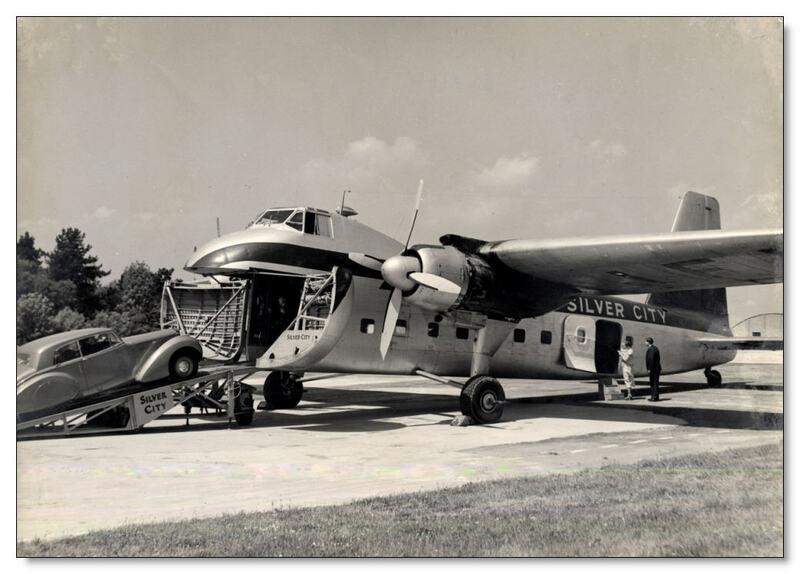 With the end of the Berlin Airlift, Silver City now had a fleet of five Bristol Freighter Mk 21s and six Mk 32 Superfreighters available for its Air Ferry operations. With the concentration of this fleet at Ferryfield, all maintenance activities were transferred there. With Silver City now firmly established at its new operating base, business grew steadily and the company expanded its operations in a number of directions. New Air Ferry routes were established between Stranraer and Belfast, Southampton (Eastleigh) and Deauville and between Southampton and Guernsey to add to the existing service between Southampton and Cherbourg. Services subsequently moved to Bournemouth (Hurn) in 1959 due to the poor condition of Southampton's grass runways. 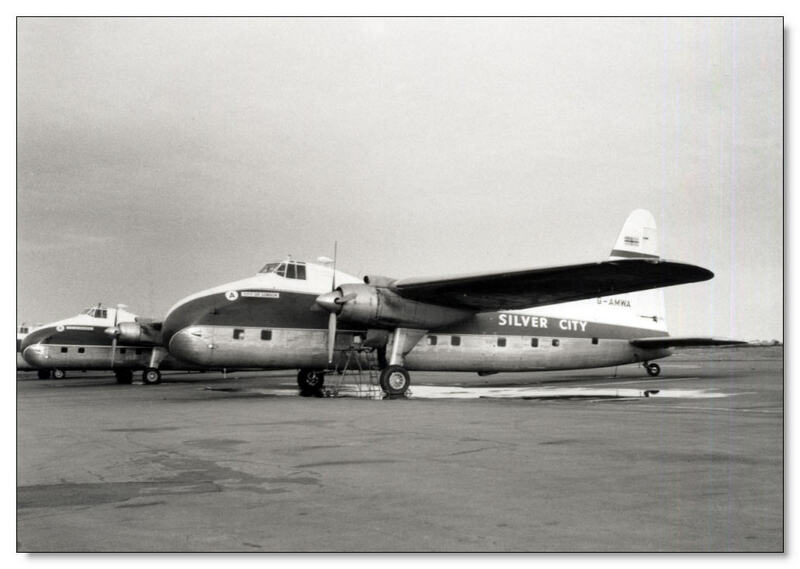 During 1955, Silver City became the largest carrier of air freight in the country with 70,190 tons being carried. 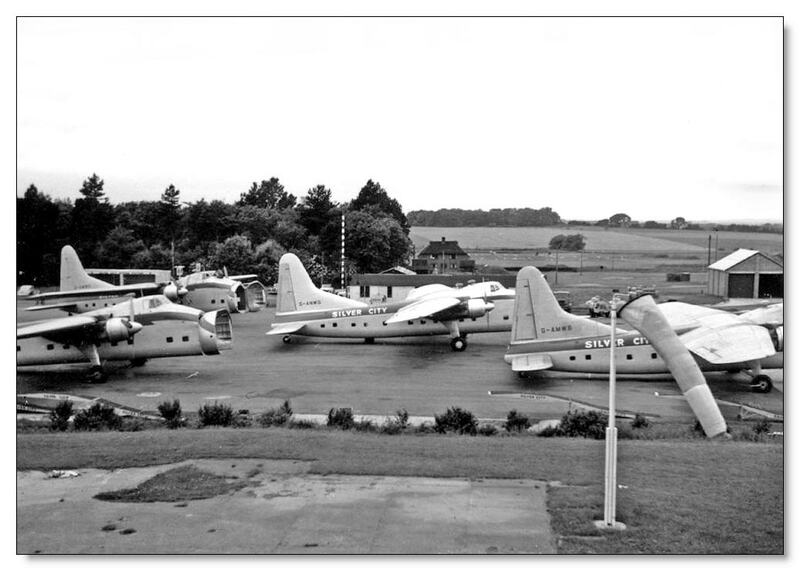 British Aviation Services (BAS) had already acquired two other companies in March 1953 - Aquila Airways, which operated flying boats out of Southampton, and Air Kruise, which flew de Havilland Dragon Rapides and Douglas Dakotas on charter and pleasure flights from Lympne, including regular charter services to Le Touquet. They were to be the forerunner of Silver City's 'Passenger Division'. 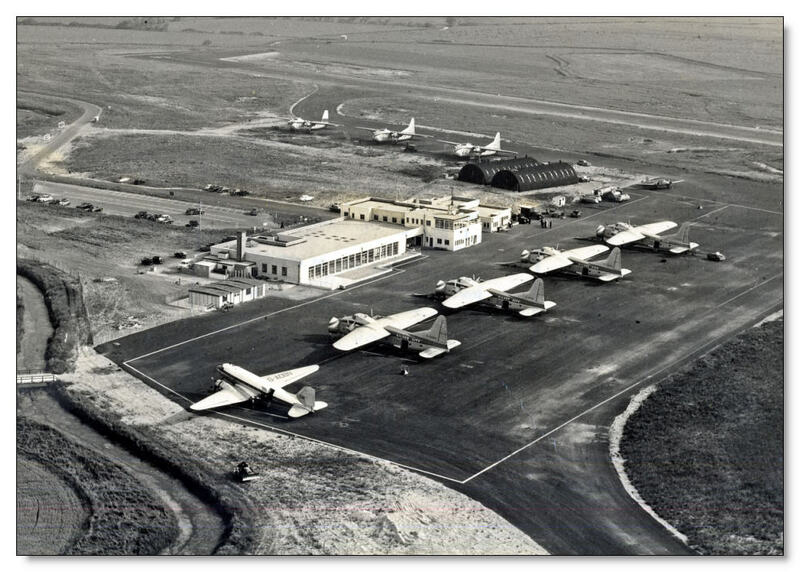 In May 1955, BAS took over Manx Airlines - based in the Isle of Man - and, in December of that year, the Lancashire Aircraft Corporation based at Blackpool. Their final acquisition was Dragon Airways of Newcastle in 1957. These three companies now became Silver City's 'Northern Division'. During 1957, the Air Ferry clocked-up one hundred-thousand crossings since its inception in 1948. In October, Taffy Powell retired and Air Kruise amalgamated with Silver City with its founder, Wing Commander Hugh Kennard, becoming deputy Managing Director. All the Air Kruise aircraft were now repainted into the silver, Royal blue and white of Silver City, as were all the Northern Division aircraft. Elsewhere, Britavia had acquired a fleet of six ex-BOAC Handley Page Hermes aircraft for use on long-range trooping flights and these were later used for charter work - including the type's first-ever trans-Atlantic flight on 14 November 1955. 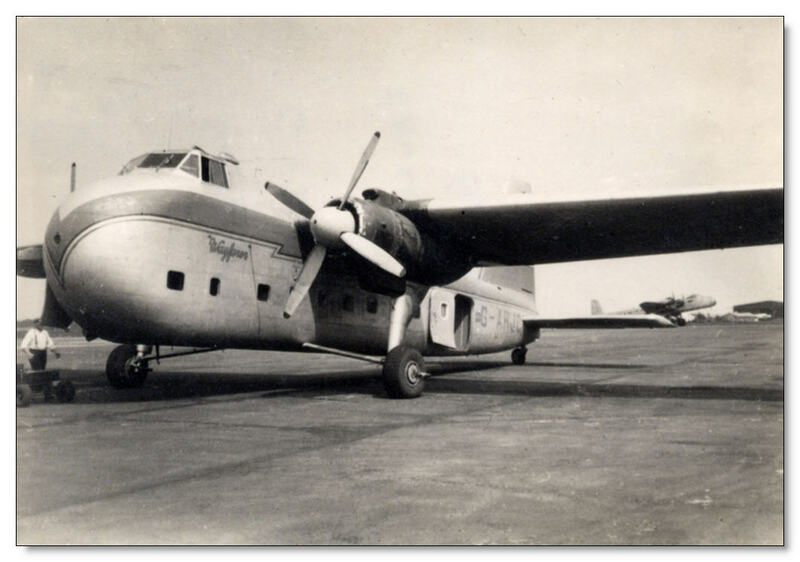 Later still, they were transferred to Silver City ownership and took on the London - Paris 'Silver Arrow' service, providing the air link between Manston and Le Touquet - the aircraft being too large to operate from Ferryfield. Silver City had also become involved in supporting the oil industry in Libya and in 1957, an 'out station' group was established in Tripoli with a second, smaller group in Benghazi. Geologists and seismic survey parties were carried all over the country and drilling sites had to be supplied with food and other essentials. 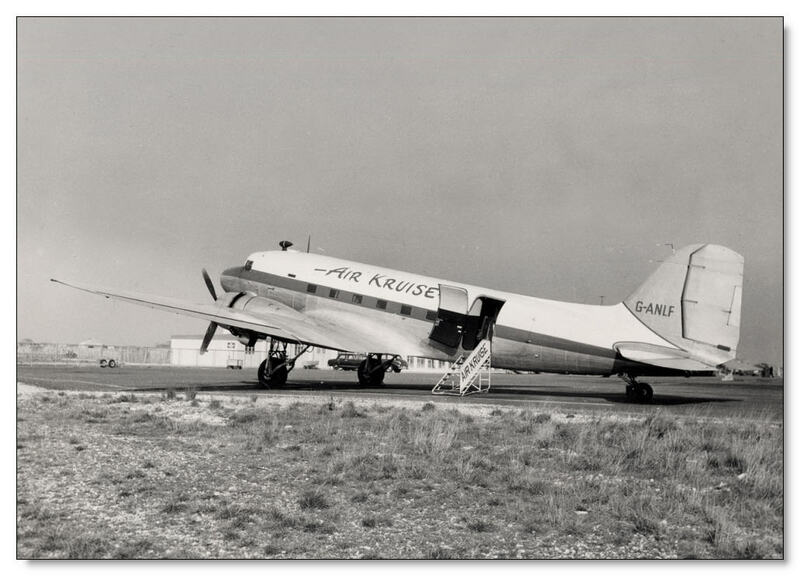 The group was disbanded in 1961 when the Belgian airline Sabena outbid Silver City for the Libyan contract. By 1960, Silver City had become a household name and taking their car on the Air Ferry was often a family's first experience of air travel. Stars of stage and screen, politicians and members of Royal families all used the Air Ferry as the best way to cross the Channel. That year, around 90,000 vehicles and 220,000 passengers had been carried and 40,000 Channel crossings had been made. In 1960, freight movements totalled 135,000 tons - an increase of 35% on the previous year. Silver City had carried a huge variety of freight loads over the years, including: import and export cars; carpets; helicopters; two 60ft racing yacht hulls; yacht masts; printing presses; tractors; sheep; pigeons; a midget submarine; race horses; and a stuffed pink elephant! Back in February 1949, Silver City had registered a new company in Paris to 'legalise' the French end of their operations. This was Société Commerciale Aérienne du Littoral (SCAL) and a number of aircraft were registered in their name. In the summer of 1961, Silver City had reached an agreement with Compagnie Air Transport (CAT) for them to build a two-mile rail spur into Le Touquet Airport from the nearby main line. In return, Silver City transferred three of their Superfreighters to CAT to operate on the Ferryfield - Le Touquet and Hurn - Cherbourg routes. The aircraft livery was identical to Silver City's except for the change of name and the appearance of the French Tricolour on the tail fin. Towards the end of the year, Silver City applied to fly a number of scheduled passenger services between various airports served by its Northern Division. The application included provision for the routes to be operated by 49-seat Vickers Viscount aircraft as well as Dakotas and so three ex-Air France Viscount 708s were leased from Maitland Drewery Aviation. These were sent to Fields Aircraft Services at Wymeswold to be refurbished and repainted in Silver City colours, although they were destined never to fly for the company due to an impending change of ownership. 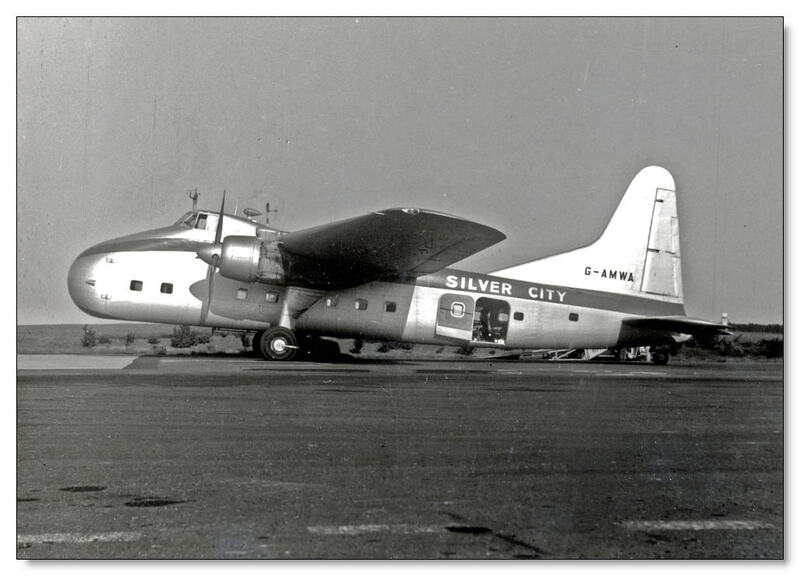 The 1961 traffic figures looked good but the company's policy of consistently cutting fares to boost demand had meant that Silver City Airways had actually made a loss of £250,000 in 1960 and £200,000 in 1961. In those days, these were considerable sums and there were rumours that a merger with Freddie Laker's Channel Air Bridge (another air ferry operation based at Southend) was likely. In January 1962, British Aviation Services (Silver City's parent company) decided to sell its shares to P&O. This enabled P&O to set up a new company - Air Holdings Ltd - which took over BAS, Channel Air Bridge and the newly formed British United Airways. Silver City's thirteen-year adventure was over. 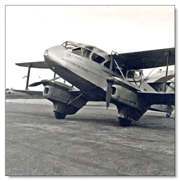 The Air Ferry service continued at Ferryfield with other operators - British United Air Ferries and then British Air Ferries - for another nine years. The last Bristol 170 flight from there was in October 1970 and the last Air Ferry flight - by an Aviation Traders ATL-98 'Carvair' - took place in January 1971. 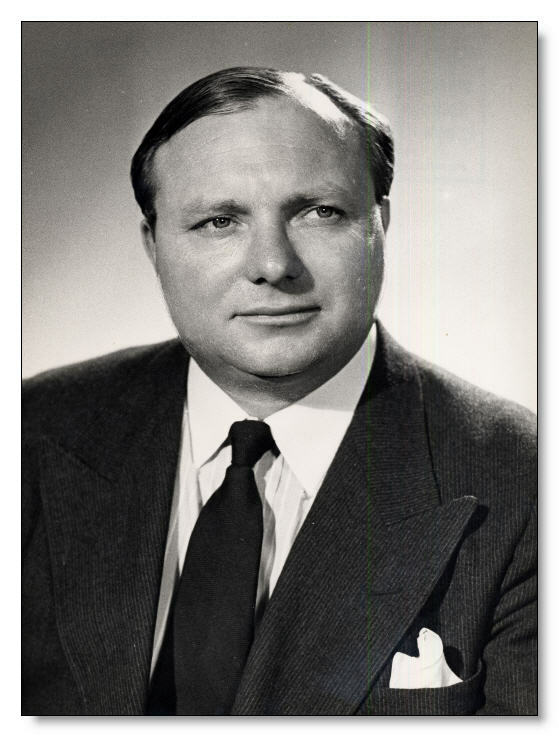 Wing Commander Hugh Kennard and his wife, Audrey, went on to form Air Ferry and later Invicta Airways at Manston. A number of reasons contributed to Silver City's demise - an important factor being that short routes such as Ferryfield to Le Touquet were heavy on aircraft wear and thus increased their maintenance costs. The answer was to operate on longer routes but suitable aircraft could not be found when they were needed. Improvements to cross-Channel ferries - with their more convenient 'Roll On - Roll Off' facilities reduced the attractiveness of the Air Ferry. The policy of consistent price cutting also has to be questioned. In its thirteen years of operation, Silver City had provided a unique service that had developed into a huge operation, the like of which will probably never be seen again. Friendly, personal and efficient service plus an excellent safety record has ensured that their passengers still look back on them with fondness and respect. Copyright ©2012 Silver City Association. All Rights Reserved. Copying and/or redistributing of any files is illegal under international copyright law.